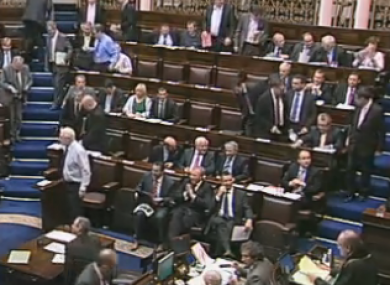 The Dáil votes 98 to 47 to boot out Mattie McGrath, after a dispute about which members can speak and when. TIPPERARY SOUTH TD Mattie McGrath has been suspended from the Dáil this morning following a dispute with the Ceann Comhairle, Seán Barrett. The dispute arose during the Order of Business this morning, when McGrath was told he could not speak on a certain point because Joe Higgins, the nominal leader of the Dáil’s technical group, had already commented on it. The Ceann Comhairle insisted that Standing Orders meant only party leaders, or the heads of the technical groups, could make contributions – but McGrath continued to interrupt a vote, seeking clarification on why he was being blocked from speaking. The Ceann Comhairle then ruled him out of order – and, as McGrath continued to complain and refused to resume his seat, asked him to leave the Chamber. McGrath refused to do so, leading Barrett to call a vote which was passed by 98 votes to 47, with Fianna Fáil, Sinn Fein and the Technical Group voting against the ejection. Independent TD McGrath attempted to clarify his stance after the vote, but was refused an opportunity to speak by the Ceann Comhairle who insisted he leave immediately. McGrath becomes the third TD – after Richard Boyd-Barrett and Éamon Ó Cuív – to be ordered out of the chamber in the current Dáil term. Email “Mattie McGrath suspended from Dáil over row with Ceann Comhairle”. Feedback on “Mattie McGrath suspended from Dáil over row with Ceann Comhairle”.